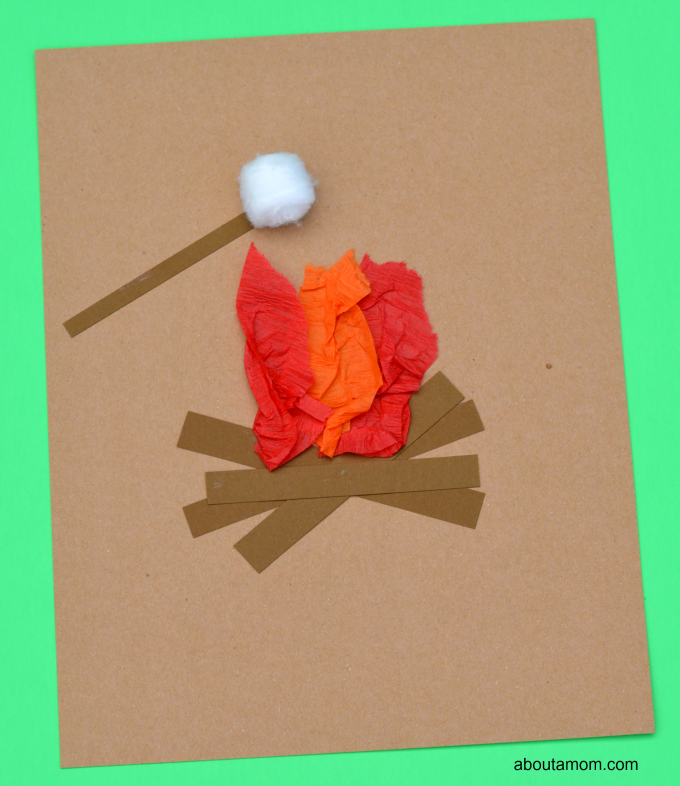 Today’s campfire craft was inspired by one of our favorite summertime activities, roasting marshmallows. The kids ask almost weekly to roast marshmallows in the summer. Their idea of roasting marshmallows is Daddy and Mommy getting the fire going and pulling out the needed supplies, so they can put their marshmallows over the fire for like two seconds. This is in stark contrast to my catch it on fire and let it burn marshmallows. The marshmallows in this craft are much more representative of how the kid’s cook their marshmallows. 1. 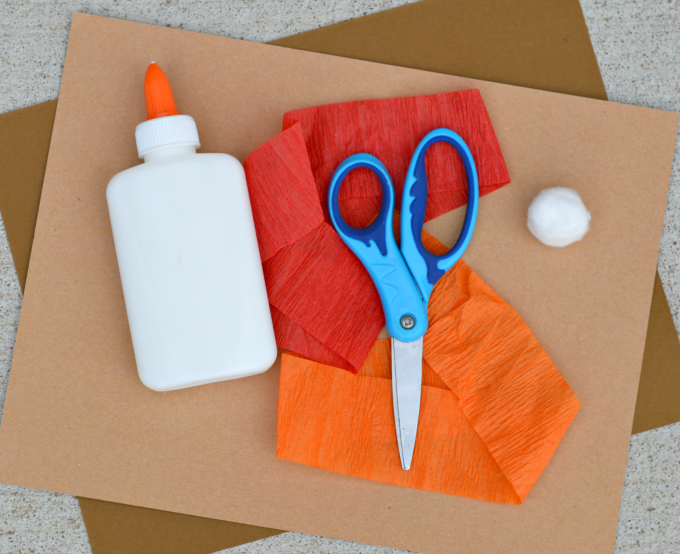 Cut strips of paper from darker brown paper to use as the logs. We used four logs in our campfire craft. 2. Layering the paper logs, glue them the lighter brown paper to form the base of your campfire. 3. Cute three strips of crepe paper. We used two red and one orange for our fire. 4. 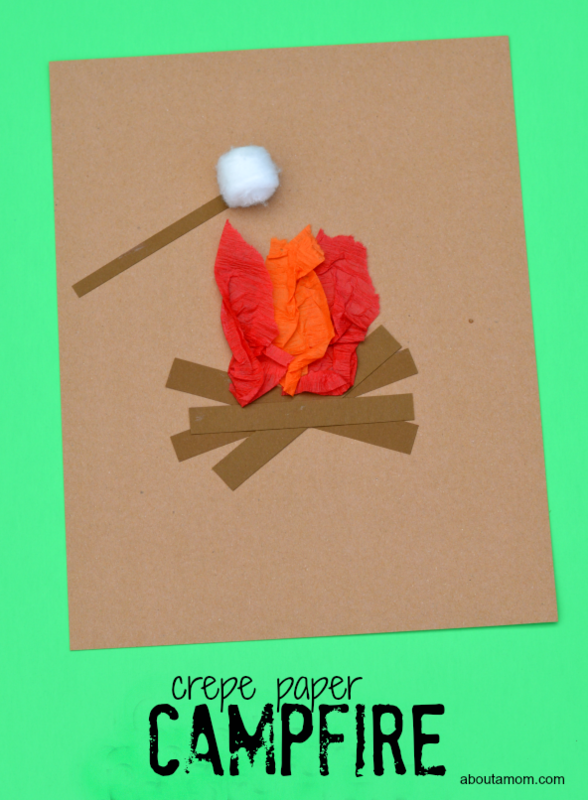 Glue the crepe paper strips to the paper above the logs to form the flames of the campfire craft. 5. Cut a slender longer strip from the darker brown paper to use as the roasting stick. 6. Glue the paper roasting stick to the paper and a cotton ball for the marshmallow. How do you like your marshmallows? Do you barely cook yours like the kids, burn them like me, or cook until lightly browned? this is such a cute craft. It would be perfect for a camping theme slumber party. That is such a fun craft! Using crepe paper really gives the flame that moving, crackling feel. Aww this is such a lovely cute idea – in fact you could almost sit around the camp fire when you make it if the weather was kind enough. That is SO cute! What a great summertime activity! How cute. What a fun summer craft. I would be amazing to do before camping with the kids. This is such a cute craft. The crepe paper works really well as the fire! What a great thing, to turn something the kids like to do, into a craft. That’s great that you are so creative to think of something like that. Great job! What a cute craft idea! I am going to do this with my kiddos! I like my marshmallows medium. Just a little bit of brown so they are crispy on the outside and gooey on the inside. This is adorable! So fun, my kids love doing crafts but sometimes we run out of ideas and they lose interest. This looks like a great one to try! I love this idea. I will have to make this with my friends little ones. That’s adorable! I know the kids will get a kick out of making it, along with some paper s’mores. oh how cute! It won’t be long before we’re camping again! We love our marshmallows any ‘ol way, burned, melted, as smores – all good!